THE ANNUAL MUSIC FESTIVAL, WHICH INTEGRATES THE CONCERTS OF CLASSICAL MUSIC, FOLK AND JAZZ. International music festival 'Autumn Tbilisi' was founded in 1993 by Tbilisi Center for Music & Culture, Tbilisi Symphony Orchestra and Tbilisi Municipality. An inspirer of the festival was world famous Georgian conductor Djansug Kakhidze. His idea was to create internationally recognized annual music festival, which would serve for regenerating of rich concert-life traditions always existed in Georgia. During its existence “Autumn Tbilisi” became one of the most distinguished and popular musical events in the country. Besides, it is already well known outside Georgia – a lot of soloists and music ensembles express a desire to participate in this event. Program of the festival is very diverse and combines concerts of classical music, folk and jazz. 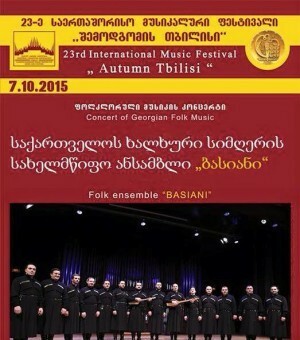 Basiani Ensemble is the host this year as a folk music performer.